With Polaris being a primary sponsor of the new US Bank Stadium, home to the Minnesota Vikings, and with the company’s home state slated to host this year’s NFL Super Bowl on Sunday, February 4th, it was only fitting that Polaris play a significant role in the pregame activities. 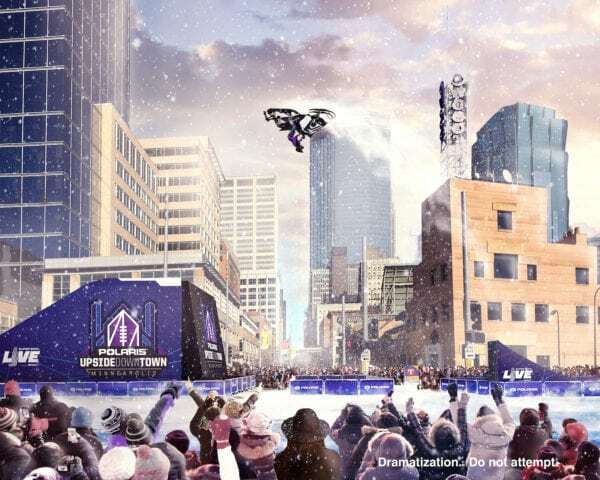 That is exactly what Polaris hopes their UpsideDowntown stunt, where Levi will perform a 100-foot backflip over Nicollet Mall, does during the build-up to the biggest event in all of sports. The jump was announced today along with a rendering of Levi’s flip. Here’s the official word from Polaris on the inverted publicity event. With Super Bowl LII just 30 days away and excitement building, the Minnesota Super Bowl Host Committee and Polaris Industries, the global powersports leader, announced another feature attraction at Super Bowl LIVE Presented by Verizon, where professional snowmobile athlete Levi LaVallee will perform a backflip over Nicollet Mall. Polaris UpsideDowntown will be open February 3, 2018 from 10AM – 10PM. It will include snowmobile stunts, meet and greets with snow athletes, giveaways and other outdoor fun in the Bold North. The snowmobile stunt show will take place at 1:30PM, finishing with a Levi LaVallee signature jump over Nicollet Mall at 11th Street. The stunt show features LaVallee, along with three other professional snowmobile athletes, including Justin Hoyer and Fred Rasmussen. LaVallee will conclude the show with a backflip on his snowmobile, launching nearly 100 feet between two ramps. A native Minnesotan, LaVallee holds the world record for snowmobile distance jump and is a seven-time gold medalist at ESPN Winter X Games (11 total medals). Super Bowl LIVE presented by Verizon will stretch six blocks on Nicollet Mall, from South 12th Street to South 6th Street, with each block offering unique and exciting Super Bowl opportunities. Fans will see larger-than-life ice sculptures, national broadcast sets, and the Verizon Up Stage at Ice Mountain, where both local and national acts will perform throughout the free 10-day festival. Super Bowl LIVE presented by Verizon will also be the public’s gateway to additional exciting events across the city, including Super Bowl Experience Driven by Genesis, the NFL’s interactive theme park which will be located at the Minneapolis Convention Center. Visit SuperBowl.com for more details. With Super Bowl LII just 30 days away, fans can visit MNSuperBowl.com or SuperBowl.com for exciting announcements and event updates!